I’m hoping I haven’t jinxed summer by writing a post about the best beanbag and courtyard spots in the city! But it had to be done, as there are some very groovy spots, with many tucked away and not immediately obvious. Feel free to share your favourites in the comments below, as there’s still plenty of summer left for us all to go exploring. Chameleon restaurant changed to a series of $26 plates between entree and main in size during the Intercontinental’s 2014/15 refit, categorised into ‘seafood tastes’, ‘tastes from the farm’, and ‘vegetable tastes’ (there’s a couple of bread-type starters between $4-$12, the oysters and shellfish bouillabaisse are priced separately, and the desserts are $16-$18). You can crack into it at two courses for $50, three courses for $70, or four for $80, with wine matching accordingly $20, $30, and $40. So given I had a wee celebration to mark, and one of my friends had never been there, we trucked off to check it out. We were presented with a pumpkin mille feuille amuse bouche to start which was delightful, and then some of us shared a roti starter so we could fit dessert. I enjoyed the crispy roti itself, but I’m still feeling a little discordant about the capsicum-hazelnut dip and baba ganoush accompaniments (I guess it challenges my favourites of the plain light and flakey one at Satay Malaysia dipped in a sumptuous curry, and the one with lemon butter at Two Souls). Whitebait salad – crisp and tasty. Serrano ham, apricot, fresh goat cheese and mint – beautiful flavours and textures, but maybe a struggle to justify $26 against some of the other dishes. Venison loin with crispy potato cake, truffled leek, apple and cranberry – classic pairings and pleasantly lightened by both the cranberry and caramelised apple. Lamb tongue with kumara foam, lemon hazelnut and pomegranate – soothing textures and flavours. Beef tenderloin with rosti, portobello mushroom, and tarragon/balsamic butter – beautifully cooked with smokey mushrooms, although the balsamic butter was rich and better with the truffle fries. Overall a sensation of flavourful dishes done with a light hand. 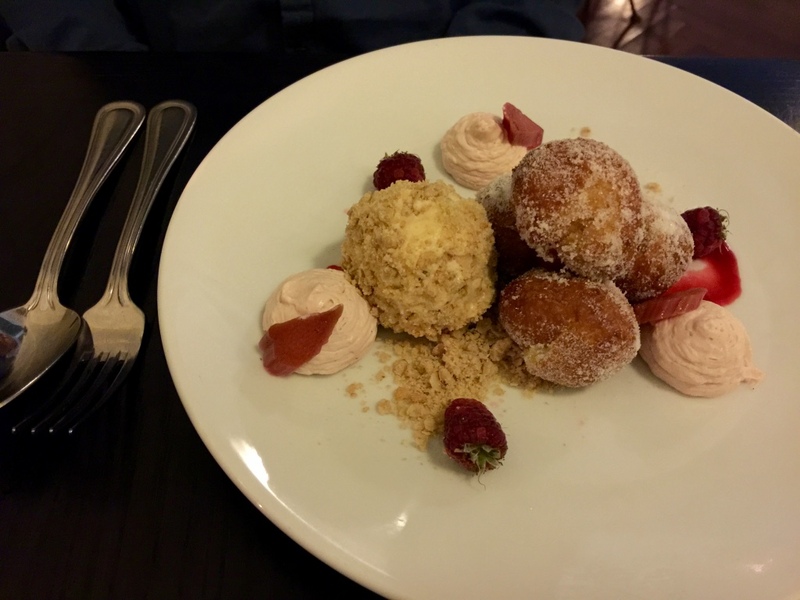 And if you want dessert, maybe just choose one ‘main’ plate that takes your eye and share another with others, as two nearly-mains can be quite filling. To dessert then. The lemon trifle was nicely dense and rated. The chocolate mousse was nice and light with tangy complimentary summer berries. And the petit fours were beautifully presented and plenty for two (or actually four people just wanting a mouthful of something sweet to finish). So, a very pleasant experience overall with the professional and reasonably formal service you’d expect, although we all found it cold by the windows (and this on a summer evening). The wine matching was judged to be very good and included a couple of new taste experiences, and you can do dessert and cocktails in the revamped bar area, so that’s another way to have a wee taste if you don’t have a full evening available.